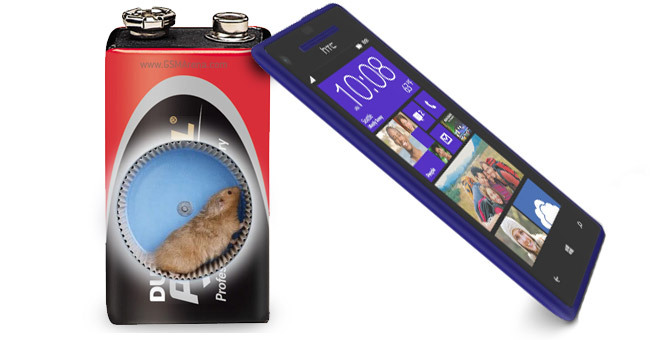 The HTC 8X has an 1800mAh Li-Ion battery and a Qualcomm Snapdragon MSM8960 chipset – virtually the same specs as AT&T’s One X, expect for the smaller screen (4.3″ vs. 4.7″). During the call test, the screen is off, so it’s not a factor and the HTC Windows Phone 8X actually manages to beat the One X (which is sold as One XL outside the US). It also beats the Tegra 3-based One X, the Samsung Galaxy S III and the iPhone 5. Good start for the 8X. Next up is web browsing and with a time of 6 hours, the Windows Phone 8-powered 8X manages to beat its Android cousin. The screen size makes a big difference here, though. The HTC Windows Phone 8X is the top half of the table, but lags the best in the category by a pretty wide margin. In our third test, video playback, the HTC Windows Phone 8X matched the score of the One X for AT&T. On the other hand the droid has a 0.4″ bigger screen, so the WP8 handset was expected to do better. 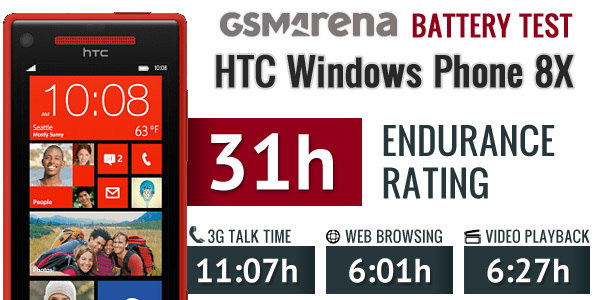 The HTC Windows Phone 8X is showing slightly above average performance so far, but the truth is it has a serious issue – standby power usage. We re-ran the test and the result came out the same – if you leave the 8X in the drawer with 3G and Wi-Fi on, the battery will drain completely in 59 hours. We calculated an endurance rating of 31 hours – that is the time you go from 100% battery charge to 0% if you do an hour each of talking, browsing and watching videos every day. You can read more about how we do battery tests here. Basically, the HTC 8X won’t last very long whether you use it or not. It will loose a good 12% while you’re sleeping, so you best remember to switch Wi-Fi off before going to bed. What’s worse is that Windows Phone’s restrictive multitasking mechanisms are meant to keep battery usage to an absolute minimum. Talk time is pretty good, but other activities will deplete the battery pretty quick. Here’s hoping this isn’t a sign of things to come for WP8 phones.